For the purposes of this post, I’m going to call these work visualizations “taskboards” but they are known by many names. 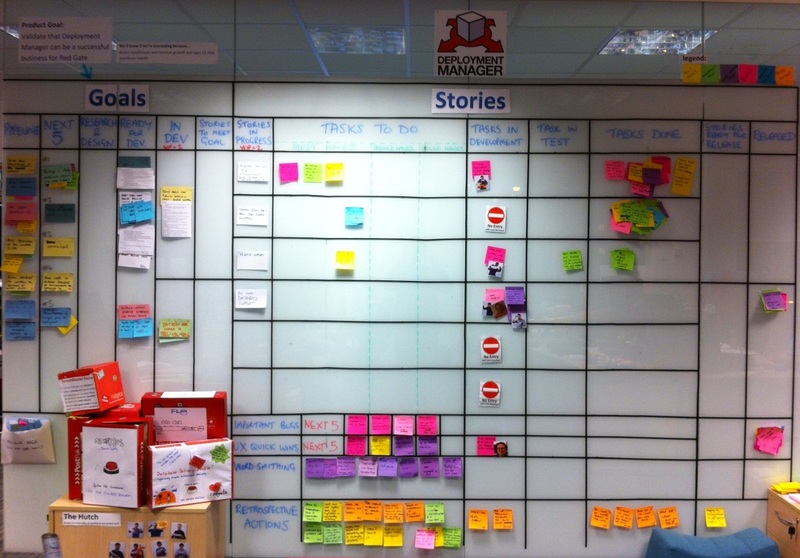 For instance, at Redgate they are called whiteboards, even though our teams use a combination of boards, walls and windows to host information. My team’s whiteboard is actually an opaque glass wall, but it works just fine! There can be something strangely motivational about the completion of a task causing a tangible change. The ritual of moving a task from the ‘in progress’ column into the ‘done’ column emphasises that you have achieved something. However, while project managers tend to agree on why it’s important to visualise work, the question of how to do this does not always reach such a clear consensus. In fact, there seems to be a dichotomy between people who favour physical taskboards, filled with tangible post-it notes and index cards, and those that prefer project management software tools, brimming with time-saving functionality and features. When I tell people that my team exclusively uses a physical taskboard to visualise their work rather than a virtual tool, I’m quite sure some of them consider me to be some kind of Luddite. They proudly, and occasionally smugly, announce that everything pertaining to their project lives inside a computer! This, they assure me, is more collaborative, saves them time and is hassle-free (apart from when it’s down for maintenance). The information should be clearly presented and in your face. It should be big and constant, so you aren’t able to ignore it. You shouldn’t be able to lock it away or hide it. All team members should use it, and use it in the same way. It should be trusted as the single, definite representation of the work going into the project. For me, a physical taskboard does this best. There are many good software tools that can provide a virtual taskboard. I’ve used VersionOne and LeanKit successfully in the past. Personally, I’d only ever use one exclusively if my team was not co-located. In fact, when I worked with a geographically distributed team, I maintained a physical taskboard situated where the few co-located members of the team had their daily meetings. That was because I wanted an information radiator. Admittedly, I could have done this with a very large monitor that permanently showed the virtual taskboard, but it was cheaper, quicker and easier to tailor a physical wall with index cards. As a central heating radiator emits heat to passers-by, a taskboard should broadcast project status to everyone who passes it. Often virtual taskboards live in browsers on individual team member’s machines. These browsers can be closed or hidden. They are more like information cabinets. Everyone knows that the project information is in there, but they need to choose to open it up to discover what it says. If you suspect something sinister lives in that cabinet, then you are probably quite unlikely to open it regularly. Maybe we shouldn’t really be trying to find a one-size-fits-all resolution to the physical vs virtual taskboard debate. Both approaches can work really well depending on the behaviour and location of your team. The more important discussion is whether your team work visualization is an information radiator or an information cabinet.